"Tikkun Olam - Repairing the World"
Integrity – Ometz Lev אומץ לב (Hebrew for “courage of the heart”) We will act with honesty and responsibility. Kindness – Chesed חסד We will act towards others with compassion and empathy. Service – Tikkun Olam תיקון עולם We will act to better our school, community, and world. I have 20 years of working in the environment and human rights field. Our school is pursuing many green initiatives including zero waste, green events, no-idling, school gardens, green procurement, energy efficiency, and green building projects. Our parent association decided to form an environmental committee, made up of both parents and faculty. One of our first goals was to become zero waste, especially for events such as the Jewish holidays, book fairs, the annual Hanukkah party, and back-to-school nights. Building relationships in the school community was a key component to making this happen. We partnered with the middle school service learning program and reached out to teachers, the head of school, the principal, janitorial staff, and other parent committees chairs. Deborah Moore of the Green Schools Initiative made a presentation to our parent association, and gave a workshop for our faculty and head of school. Once we obtained our extra green and blue bins for composting and recycling, the key was to communicate about proper waste sorting to everyone coming to school events. We also provide large water containers at all events to discourage people from bringing disposable plastic bottles. We wrote articles for the school newsletter about recycling and composting, put up signs, and made announcements at every event. Teaching everyone about proper sorting is an ongoing effort. We wrote articles for the school newsletter about recycling and composting, put up signs, and made announcements at every event. Teaching everyone about proper sorting is an ongoing effort. We have been making great strides towards reducing the amount of garbage and increasing both recycling and composting of waste. We have installed energy efficient lighting, and use non-toxic cleaners and recycled janitorial paper products. We have an environmental column in our weekly school newsletter and we are working to get a web page up promoting our efforts. Everyone in our school community has helped us accomplish our goals. We were fortunate to have very supportive parent association presidents, who helped us reach out to all parent committee events to ensure that the events were green. One challenge was that each of our many parent committees had a separate budget for their events and food service purchases. A big turning point came in the Fall of 2008 when one of our environmental committee chairs started working with the Sukkot dinner committee. The Sukkot dinner is one of our biggest events. It involves catered food, and brings the most participation from the wider school community. The environmental committee chair found bulk compostable utensils and cups that were cheaper than at Costco. The Sukkot dinner committee was delighted. From that event onwards, all of the parent committees decided to pool our event purchase budgets and buy compostable food service supplies for all committee events for the whole year. The key to the success was getting folks to dispose of items that would have gone in the black landfill bin into the green compost bin -- we even bypassed the blue bin to make things easier for folks. Kids from the middle school’s service learning program are very involved in our green initiatives. They made signs for all bins for our green events. They held a green breakfast and invited the school community to bring in e-waste such as batteries and cell phones. They provided a breakfast of bagels, coffee, and hot chocolate to lure people in, and used our compostable food service supplies. They also displayed posters with environmental tips. We are planning to work with them on a cost-benefit analysis of green procurement. Faculty also has engaged students at lunchtime with a zero waste challenge in which students weighed their lunches before and after eating. The class with the lowest weight of waste won a prize at the end of the week. It’s the kids. We want a healthy environment for them, and we also want to teach them about the Jewish tradition of Tikkun Olam, which means “repairing the world.” These kids are going to be adults very soon. We want to teach them to leave the planet in better shape than they found it. Education is where it starts. I’ve been doing environmental advocacy for 20 years. Lately I’ve been inspired by the number of people taking action to reduce our environmental impact. What was once only embraced by early adopters has become the norm, even the law in some places. Once people see everyone else doing these things, they want to get on board. It’s important to understand what keeps people from participating in green initiatives and eliminate those barriers. 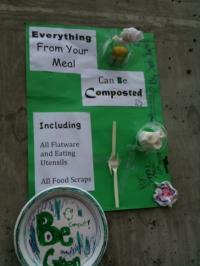 In the case of recycling and composting, people won’t do it at school events if they don’t do it at home. You have to make it as easy as possible for them. Ultimately, we realized that the easiest thing to do was to have one green bin, so there was no confusion about sorting. We made sure all the food service ware was compostable. It is also essential to retrain the janitorial staff. The teachers and kids understood the three colored bin sorting system and sorted their waste properly, but because the janitorial staff wasn’t properly trained they were putting all of the waste into a single bin at the end of the day. Given the budget crunch here in California, perhaps the most important advice to parents is to hold fundraisers for your school’s environmental initiatives. We’ve sold ChicoBags and Fair Trade coffee, chocolate, and tea at our events. That helped us raise money for janitorial equipment and the medium-size green waste bins for placing around the school during events.